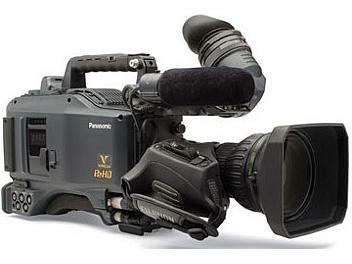 The Panasonic AJ-HPX3700 is a 2/3" 3-CCD 1080 P2 HD VariCam Camcorder with 4:4:4 Capability. - Offers choice of progressive/interlace HD video formats including native 1080 23.98p/24.00p/25p/29.97p/30.00p, as well as 1080 50i and 1080 59.94i. - AVC-Intra compatibility with leading NLEs, including Apple Final Cut Pro 6, Autodesk, Avid Media Composer Family Version 3.0, Avid NewsCutter Family version 7.0 and Quantel. - 4:4:4 compatible with the Panasonic AJ-HD3700B D-5 HD VTR with AJ-HDP2000 2K Processor. - Scan reverse allows for anamorphic lens adapter use (to create a 2.35:1 aspect image for wide-screen cinematic shooting), or, use an HD lens adaptor for 35mm lenses.